This ring will definitely pack some serious sparkle because it already has two .75 carat diamond sidestones before you even pick out your center diamond! The diamond of your choice (which must be a round diamond, by the way) will complete this ring. Create a head-turning engagement ring that's packed with carats with this three-stone engagement ring! Two large, .75 carat round diamonds sit on either side of your center diamond, adding even more sparkle to the beautiful 14k yellow gold band. Your center stone must be a round diamond. Brilliant three stone setting for Asscher cut diamonds! With this setting, you have one big Asscher cut diamond popping out at you and then two smaller diamonds flanking it on either side. An impressive engagement ring sure to please anyone. This impressive engagement ring has two BIG radiant cut sidestones -- .75 carats each, totaling 1.5 carats. Then, add your center diamond, a radiant cut diamond of your choice, to complete this stunning setting. Two large radiant cut diamonds (.75 carats each!) go with a center radiant cut diamond of your choice to complete the look. A gleaming, 14k yellow gold band holds everything together with stunning X-shaped prongs holding the diamonds. This stunning engagement ring features four princess cut diamonds in a prong setting and is the perfect ring for your queen. You are able to select the center diamond to give the ring a more personal touch and all of the diamonds are set in the best platinum available. 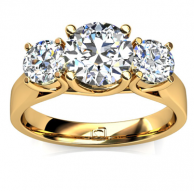 This brilliant ring is the perfect symbol to symbolize your love. It looks great with everything, is unique yet simple, and is sure to bring a smile to your future bride’s eyes. 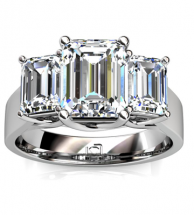 This exquisite four stone emerald cut diamond engagement ring in platinum is sure to please its receiver. 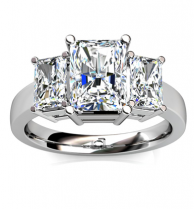 It features four emerald cut diamonds in a prong setting that lead up to your choice diamond in the center, to give it your own personal touch. Pave diamonds line the platinum band as it tapers out at the top as it reaches your center diamond. 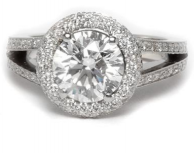 Even more smaller, micropave diamonds accent the prongs that hold the center diamond securely in place. 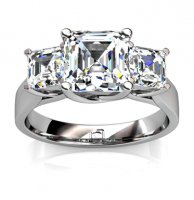 This engagement ring can be set with a round, princess, or cushion cut diamond. Check out the squared edges on the band on this ring -- great for a modern, sharp look. This is a special order only setting, which will ensure that you get a perfectly matched and built engagement ring. You can set this ring with most diamond shapes. Gorgeous designer ring with pave sidestones (plus a pink sapphire!). Two large, impressive pear-shaped side stones (1 carat total!) accent your center diamond. The knife-edge 14k yellow gold band provides a shining circle of light around the finger. 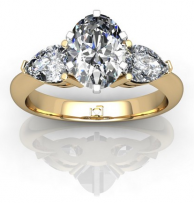 You can choose any shape/size diamond to grace this beautiful engagement ring. This absolutely stunning engagement ring features a full pave platinum band that is packed with diamonds! Your center diamond will be breathtakingly highlighted by the pave diamonds that go around the entire band. Also, if you look closely, you can see that the pave diamonds have been set with shared prongs. This scintillating engagement ring is designed to wake up your inner passion with its lavish details. First, your center diamond sits among a sparkling design of halo diamonds. The 18kt yellow gold band is further decorated with 8 additional large, pave prong-set diamonds. Finally, a micropave design accents the crown. 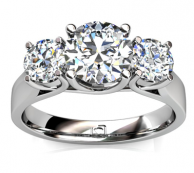 Your center diamond can be round, princess, Asscher, emerald, or oval shaped. This scintillating designer engagement ring combines a halo of round diamonds surrounding the center stone with four large pave diamonds on either side of the 18k white gold band. This ring is made for a cushion cut diamond, but can also be set with a round diamond. Ritani's offering a great engagement ring here. You can't really see it from the picture here, but there are also some micropave diamonds going around the setting that holds the center diamond as well. Worth a look. This brilliant engagement ring features the center diamond of your choice, a row of sparkling channel-set diamonds decorating the band, and micropave diamonds accenting the setting holding your center stone. You can set this ring with a round, princess, asscher, cushion, oval, or radiant cut diamond (shown here with a radiant diamond). 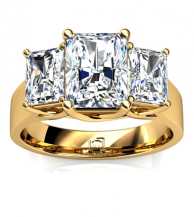 This beautiful engagement ring sparkles from all angles! French-set pave diamonds line this thin platinum band while micropave diamonds decorate the upper sides and prongs holding your center diamond secure. Your centerpiece can be a round, princess, emerald, cushion, oval, or Asscher cut diamond. 2 elegant pear-shaped diamonds stand on either side of your center diamond, creating a unique design that will wow its audience. A 18k white gold band holds the sparkling diamonds in a Royal Crown setting. This ring can be set with a round or princess cut diamond. More than your standard three-stone engagement ring, this setting features 4 diamonds on the sides of your center diamond, totaling 5 diamonds in all. This ring can be set with any shape diamond, either way, you'll end up with a beautiful ring that sparkles brilliantly.